Molokai Renewables wind developers planned to host an open-house discussion about the proposed wind turbines project last Tuesday, but community members interrupted their agenda. Taking bold steps to express their mana`o, anti-wind supporters of the Molokai group I Aloha Molokai (IAM) ignored informational posters sitting on tables, except to draw large red Xs through two. The meeting at the Maunaloa Community Center was the first of three last week hosted by Molokai Renewables LLC, a group formed by alternative energy developer Pattern Energy and developer Bio-Logical Capital. Representatives meant to distribute information and gather community input on potential benefits packages in exchange for a proposed 200 megawatt (MW) wind farm on Molokai’s west end. The turbines would provide power to Oahu via an undersea cable to help the state reach its goal of 70 percent clean energy by 2030. Pattern has a lease agreement with Molokai Properties Ltd. (MPL), also known as Molokai Ranch, to use 11,000 acres of land should the project move forward. Although Molokai Renewables hosted the meetings held Tuesday, Wednesday and Thursday nights, IAM supporters often stole the show. They pointed to overwhelming local opposition to the project – including surveys conducted by resource management group `Aha Ki`ole and IAM that showed opposition among Molokai residents at 93 percent and 97 percent, respectively, and IAM’s increasing membership, which was more than 940 residents last week. They repeatedly asked the developers to pack up and go home. Developers planned to discuss potential benefits for the Molokai community during the meetings, according to Julie Witherspoon, manager of project strategies and acquisitions for Bio-Logical. Based on a percentage of their expected revenue, she said Molokai Renewables estimates Pattern would give about $1.5 to $2 million back to the community annually during their 20-year lease with MPL. Hawaiian Electric Company (HECO) Executive Vice President Robbie Alm attended the Wednesday meeting at the Mitchell Pauole Center. He said Molokai Renewables’ potential contract with HECO would likely include a minimum benefits package of four commitments discussed in a similar agreement with Lanai residents. They include balancing Molokai and Oahu energy rates by dropping Molokai’s by 30 to 35 percent and increasing Oahu’s by less than 1 percent; making Molokai 100 percent renewable by 2020 through other energy programs; requesting a “Pay as You Save” program from the Public Utilities Commission to finance individuals’ solar energy projects; and fixing current grid issues on the island, which are the cause of a 15 percent cap on installation of renewable energy systems by home and business owners. A HECO-commissioned report is due in July to assess the latter problem, Alm said. Many community members voiced their opposition, citing grave concerns about the project’s potential impacts on Molokai’s people and environment, and asked whether wind energy officials would listen to their opinions and put a stop to the project. Although officials avoided a definitive response during the first two nights of meetings, Pattern’s Senior Developer Christian Hackett was more forthcoming Thursday at Kilohana Elementary School. Still, Keiki-Pua Dancil, vice president of Hawaii Business Development and Strategy at Bio-Logical Capital, said developers are continuing the conversation and moving forward with baselines tests. “There is a process we have to go through and part of that process is to meet with the community and ask the community how they feel, and that’s what we’re here to do,” she said. Rancher Jimmy Duvauchelle, who delivered Tuesday’s pule with an IAM sticker on his shirt, said he was undecided and others might be, too. “When sitting down under a mango tree with a local, talking heart to heart, [and] thinking with all the benefits … [this] may be the answer to our rough economy,” he said, adding that some community members are “not that kind of loud” in expressing their opinions. Some might be intimidated to support the project, he said. Helm and most other community members at the meetings said there are no benefits worth allowing Molokai Renewables to move forward. IAM organizer Cora Schnackenberg lamented enabling what she called Oahu’s “addiction” to energy at the cost of Molokai’s future, and many called for decentralization of energy projects. “If you know our culture, you should know what you’re asking of us,” she said Tuesday. Dancil said Tuesday that developers are at the start of a long process, likening it to a marathon. If the finish line is deciding whether or not to do the project, she said, the group is still in training, with many studies on the environmental, cultural and social impacts of the proposal yet to begin. Avian studies examining bird flights have only just begun, she said, and the total list of studies needed is still to be determined. Those tests would also determine how much energy would be lost en route to Oahu. Pattern provided estimates of 40 percent energy loss plus 5 percent lost during transmission. But IAM member Mike Bond, who worked in energy development for 30 years, said he doubted the turbines would achieve even 20 percent capacity. Alm said HECO is not declining any renewable energy proposals that would help meet the state’s energy goals. Community input will be factored in during the permitting process, he said, pointing to estimates of about 70 permits and four Environmental Impact Statements (EIS) needed to give the project a green light. He said Molokai residents should still discuss benefits in case those permits are granted. Peter Nicholas, CEO of MPL, declined requests for comment last week. More information about Molokai Renewables is available at www.patternenergy.com/molokairenewables or by e-mailing info@molokai-renewables.com. More information about IAM is available at www.IAlohaMolokai.com or by e-mailing IAlohaMolokai@gmail.com. The Public Utilities Commission (PUC) ordered last Thursday that Hawaiian Electric Company (HECO) restart the bidding process for 200 megawatts (MW) of renewable energy. The decision opens up other companies and islands to replace the energy that could be generated by a wind farm on Molokai. This means wind company Pattern Energy, which has been in discussions with the community and land owner Molokai Ranch to develop the project, would have to enter the bidding process to move forward. The decision gives HECO 90 days to submit to PUC a new draft request for proposals (RFP) for the 200 MW. Bidders could propose projects of any renewable energy types – such as wind, solar or geothermal – on any Hawaiian island “that can reasonably reach Oahu via an inter-island cable,” according to a PUC press release last week. Pattern recently teamed with developer Bio-Logical Capital to form Molokai Renewables and pursue the local wind farm. Molokai Renewables “will continue to work with the community and other stakeholders to progress the wind farm project,” according to a statement to The Dispatch released via Keiki-Pua Dancil, vice president of Hawaii Business Development and Strategy at Bio-Logical. Dancil did not confirm whether the company will submit a bid. In a separate decision last week, the PUC approved Maui County and Hawaiian-based environmental group Life of the Land as interveners in HECO’s case seeking to charge ratepayers for studies assessing Big Wind’s potential undersea cable. Interveners can be accepted by the PUC to offer more information during controversial proceedings. PUC Chief Counsel Catherine Awakuni stressed that neither decision is an approval nor denial of the 400-MW project in part or whole. “There are still a number of different review processes that need to take place,” she said. In 2008, PUC approved Castle & Cooke to develop a 400 MW wind farm on Lanai, and a year later, approved wind company First Wind to split the project by building a 200 MW project on Molokai. PUC waived the normal competitive bidding process for the project. Under the agreement, if the Molokai project fell through, Castle & Cooke could build the entire 400 MW on Lanai. However, when First Wind missed the deadline to move forward on Molokai, Castle & Cooke attempted to assign the Molokai portion of the project to Pattern Energy. The PUC determined its original agreement “neither allowed for such an assignment nor contemplated Castle & Cooke ever building a wind project on Molokai,” according to its press release. The decision was greeted by a mix of excitement and caution from groups opposing the so-called Big Wind project. Anti-wind group I Aloha Molokai (IAM) organizer Kanoho Helm was cautious about celebrating the decision, saying IAM will not stop spreading its anti-wind message until it’s “written on paper” that wind farms will not be built on Molokai. HECO is seeking to charge ratepayers $3.9 million for studying the feasibility of an undersea cable transmitting power generated on neighbor islands to Oahu. PUC approved Maui County and Life of the Land as interveners in the case. Mayor Alan Arakawa felt that neither the proposed projects on Molokai and Lanai had “adequate community benefits,” according to McLeod. “We got involved because there was a genuine level of distrust in the community about what was happening,” he said. PUC’s Awakuni said the interveners are allowed only to discuss “whether the costs of studies are appropriate” and whether they may be recouped. “[HECO will] have to show that they looked at the alternatives, that these are not one-sided studies being rammed through to justify their project,” said Henry Curtis, executive director of Life of the Land. Both decisions are available at the PUC’s website, puc.hawaii.gov. The order to restart the bidding process is found in docket 2009-0327. The decision to allow interveners in HECO’s attempts to charge ratepayers for studies is found in docket 2011-0112. Molokai Renewables developers confirmed last week they will place a bid to build a 200 megawatt (MW) wind farm on Molokai once a new request for proposals (RFP) is released this fall. Meanwhile, activist group I Aloha Molokai (IAM) continues to speak against the proposal in new and creative ways, including a film series, Facebook page and an upcoming Molokai energy festival. The Public Utilities Commission (PUC) gave Hawaiian Electric Company (HECO) 90 days in July to create the new RFP. The decision found HECO did not follow due process in allowing developer Castle & Cooke, which planned to build a 400 megawatt wind farm on Lanai, to assign half of its MW to Pattern Energy to be built on Molokai after another developer, First Wind, failed to submit paperwork on time. Energy generated would be transmitted to Oahu via an undersea cable, although the efficiency of transmission is debatable. The PUC said companies may propose to generate the 200 MW using any form of clean energy on any island that could “reasonably” reach Oahu via the cable. The 90-day period ends Oct. 14, after which the PUC must approve HECO’s RFP before developers may bid. “At this time, Molokai Renewables does plan on submitting a bid when the final RFP is issued,” Keiki-Pua Dancil, vice president of Hawaii Business Development and Strategy at Bio-Logical Capital, said via email. Bio-Logical partnered with Pattern this year to create Molokai Renewables and pursue the project. But organizers of IAM, which formed in May this year in opposition to the proposed project, said there are no benefits worth the impact of building dozens of turbines more than 40 stories high and likelihood of destroying reef to build the undersea cable. As a result of weekly meetings at the Office of Hawaiian Affairs (OHA) conference room, they’ve recently expanded their communications efforts to better reach residents of Molokai, Hawaii and the mainland, as well as media and politicians. Dancil confirmed Molokai Renewables is continuing initial studies of the potential construction sites as they await the RFP’s release. “We remain committed to working with [Molokai residents] to seek to create a sustainable project that restores and conserves the land, preserves the rich culture and way of life, and protects the ocean and local food supply that Molokai depends on, and provides other substantial benefits to the Molokai community,” she said. The confirmations arrive as Governor Neil Abercrombie increases his public support for the project, condoning it on a recently aired PBS program. He was one of 24 governors to sign a July 20 letter asking President Obama for a “combined intergovernmental state-federal task force on wind energy development … charged with expediting deployment activities,” among other things. Nearly 400 people are official IAM members, according to organizer Cheryl Corbiell. To be counted, people must fill out a membership form available at IAM meetings, at their Saturday market booths in Kaunakakai and Kualapu`u, or on their newly updated website, IAlohaMolokai.com. The website’s update coincides with the creation of a new Facebook page, “I Aloha Molokai,” which had garnered more than 220 fans as of last Sunday. The organization also released two short films written, edited and produced pro bono by award-winning documentarian PF Bentley, a Molokai resident and IAM member. The films, which are available on fundraising website Kickstarter.com, the “I Aloha Molokai” Facebook page, YouTube.com and Vimeo.com, are a way “to let people know what’s going on here, and to show what we are fighting to save and what’s here,” Bentley said. Among all of the sites, they’ve already garnered thousands of views; the first film tallied with nearly 3,000 views in less than two weeks via YouTube alone and about 6,000 total views as of Monday morning, according to Bentley. IAM also secured Mitchell Pauole Center for Jan. 14, 2012 to host an energy festival, in which alternative energy vendors from Molokai, Oahu and elsewhere will provide information and sell services to interested individuals. Standing on the side of Maunaloa Highway last Wednesday – with the red dirt and green grass of Pu`u Nana Hill behind him, the blue ocean and white sands of Mo`omomi down below – Kanoho Helm made a sweeping gesture with his hand. He pointed to the some of the 11,000 acres on which local families hunt deer and gather opihi to feed their families, he said, and which is home to important shrines and burial grounds. Raised in Ho`olehua, Helm knows these lands well. But for some of the others with him, including Sen. Mike Gabbard, the moment was an introduction to some of the 11,000 acres on which developers propose to build industrial wind turbines, sending renewable energy to Oahu via undersea cable to help the state meet its clean energy goals. Gabbard, who chairs the senate’s Energy and Environment Committee, had just arrived on Molokai for a day-long tour, along with fellow committee member Sen. Kalani English, whose district includes Molokai, Rep. Denny Coffman, who chairs the Energy and Environment Committee in the House, and Susan Kodani, senior adviser to Congresswoman Mazie Hirono. The legislators planned the unusual trip – meeting with residents in informal settings instead of during formal hearings – to get community mana`o about the proposed wind farms and cable. 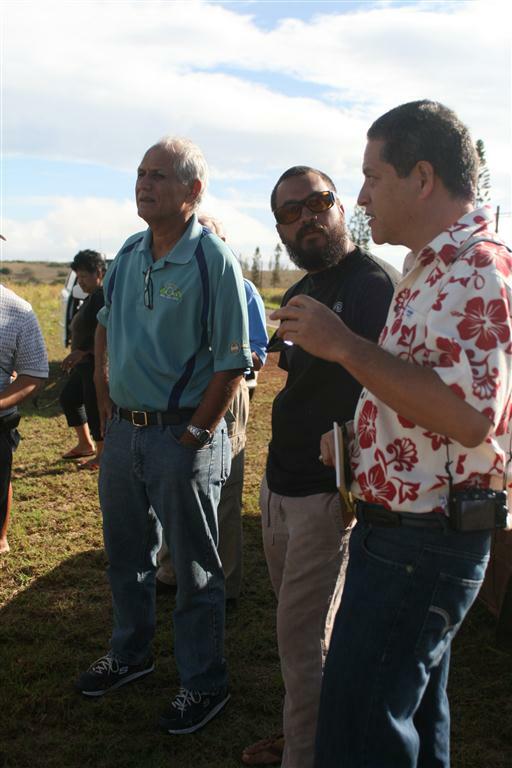 Sen. Mike Gabbard, I Aloha Molokai organizer Kanoho Helm, and Sen. Kalani English look over the site of proposed wind turbines during a legislative visit to Molokai last Wednesday. Photo by Maggie Cassdiy. They had previously scheduled a site tour with representatives from developer Pattern Energy, a company with plans to develop the wind farm on Molokai. But as that tour was canceled, the legislators took an impromptu trip to the highway’s edge and part-way down the road to Hale O Lono with Helm and other residents. Senators’ reasons for canceling the Pattern tour varied. English said “[Gabbard] wanted us to come here was neutral as possible; that’s why we told [Pattern representatives] ‘no, you don’t need to show us around,’” while Gabbard later said it was Pattern who “called and said we basically think it’s better if we give you maps, so there’s not any perception out there” that the tour is biased. Gabbard and English said the informal tour they received from local residents was beneficial to understanding the proposal. They also made stops in Maunaloa, Kualapu`u and Kaunakakai, where they heard a consistent chorus of opposition to the proposed “Big Wind” project. The vast majority of people at gatherings in Maunaloa, Kualpu`u and Kaunakakai said they opposed the wind turbines. Many of the nearly 300 total attendees they represented their entire `ohana and the dozens of people who could not attend because of work. The trip preceded a similar visit to Lanai last Thursday, which Gabbard said was more divided among residents for and against the project. A consistent theme of those opposing the wind turbines was preserving the Molokai lifestyle for future generations. Industrial wind turbines would “ruin our lifestyle here on Molokai for someone else’s benefit,” said Andrew Arce, a third-generation homesteader, during the group’s stop in Kualapu`u. Matt Helm said he wanted his four children to “have the same experience I had here, gathering our food without ‘no trespassing’ signs,” while Ui Colon echoed similar sentiments. “What appalls me is what little regard for intelligence and expertise is given to people who have lived here for generations and generations,” Ehulani Kane said in Kualapu`u. While most meeting attendees opposed the project, Gabbard he said he spoke to about “half a dozen [residents who] had not taken a position for or against” and “wanted more information on what kind of benefits” might be available to Molokai. Jimmy Duvauchelle, who delivered the pule before the gathering in Maunaloa, said the prospects of windmills made him emotional and frustrated. While he doesn’t like the idea of them, he said benefits might help Molokai in the face of extreme economic challenges. Resident Juan Trinidad offered similar testimony in Kaunakakai. “Whether it’s windmills or some other things, we’re in a very, very bad [economic] situation. We are getting worse,” he said, questioning whether the wind farm might help struggling families. Gabbard recommended residents seeking more information call his office at 808-586-6830. He added it was also partially Pattern’s kuleana to provide education about the proposals. Still, most said there were no benefits worth the impacts of industrial turbines. Gabbard said he heard residents’ mana`o “loud and clear.” He said his three biggest takeaways were that the “vast majority” of residents “do not want a wind farm under any conditions,” that Molokai residents want each island to take care of its own needs, and that natural resources should be left alone. In a phone interview Sunday, Gabbard said he had not yet had a chance to fully debrief with the other legislators. “The feedback that we got was incredible on both islands,” he said. Videos of the visits recorded by documentarian PF Bentley are available online at youtube.com/user/IAlohaMolokai.